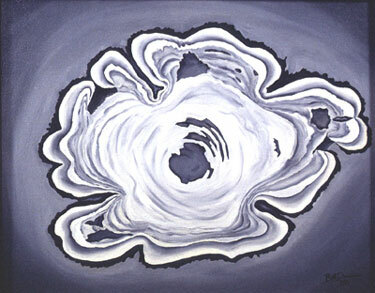 Many people ask me why I paint exclusively in black and white. The simple answer is that I don’t; I sometimes paint in colors, when it serves a creative purpose. I find there to be a great deal of expression available in monochrome work, and a great deal of subtlety that is hard to achieve amid the distraction of colors. The other little thing is that when I started out I had very little money, so I bought a tube of white, a tube of black, and some stretcher bars and began cutting up old tents to paint on. I always seem to work in oils for this sort of thing. The Horizons Olympia paintings are part of a series that is eventually to include views from Portland, OR, Seattle, WA, Vancouver, BC, and Anchorage, AK. They reflect my fascination with the shapes formed where the earth meets the sky, and the way those shapes contribute to a sense of place, even when they are sometimes obscured by the city that occupies that space. The Horizons Portland paintings are part of the series that includes the above paintings, and is to include images from Seattle, WA, Vancouver, BC, and Anchorage, AK. I made the sketches that these are based on from the area around the Willamette Stone, near Skyline Blvd. 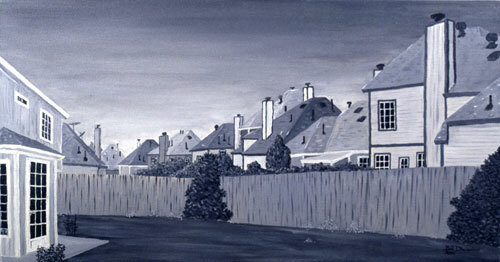 It somehow seems fitting to paint images of the views from the location from which much of the northwest was surveyed. These next paintings, abstractions based on parts of trees, are one of my attempts to look for the beautiful in the very ordinary. Apple is simply a close look at a branch pulled from a pile of prunings one winter. The red cedar painting is based on one of the two ends of a cedar log cut from a tree that blew over in a storm. There is another based on the other end of the log, and not pictured here. 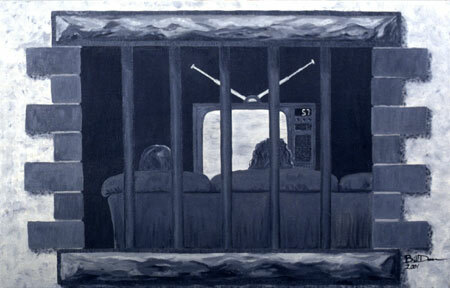 Chained to the Electronic Hearth is simply an expression of my frustrations about television and what it does to society. The Wide Open Spaces of Texas is based on a sketch I made while visiting a friend in Dallas. I was struck by how in a place so open, people could live lives so closed in. The only truly wide-open thing there was the sky, and on the day I made the sketch there was a storm looming. 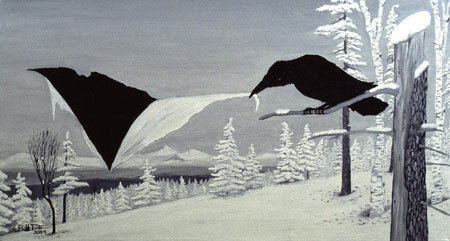 I like watching ravens in the snow. They seem so black against all the white, like a hole in the sky. One day I got to wondering, what if the raven was to tear a hole in the world? Hole in the Light of Day is my attempt at an answer. These next two paintings are nudes of the musician, Jenny Anderson, playing her mandolin, which she says is old enough to be her great grandfather. In the first painting Jenny is clearly the subject. I was looking at the way that she loses herself in the music when she is playing. In the close up painting I wanted to blur the line between subject and context, asking is this a painting of a musician playing, or of an instrument, with the musician’s body as the backdrop? And further, from where comes the music, as neither makes it without the other. 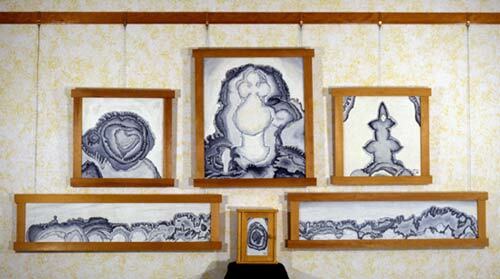 The paintings that follow are a series of six paintings intended to be displayed together in the arrangement shown in the picture of the Small Scale Trial Paintings. 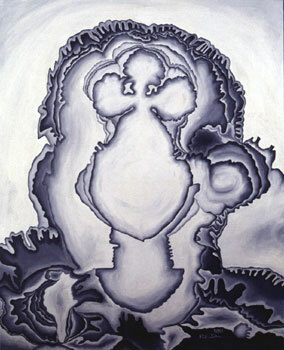 It is easy enough to make a painting in which everyone sees more or less the same thing when they look at it. “Look, a picture of a girl with a mandolin, and one with a mountain.” In these paintings I wanted to create images that people could look at and see different things, not just a simple inkblot test, but something with depth that makes the one think in new ways. 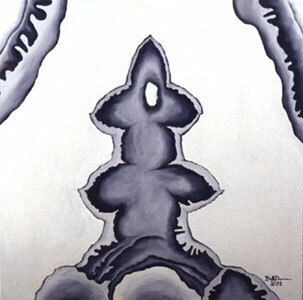 “Is this coming forward or receding, is it a landscape or something alive, or is it some sort of symbol?” My intent is that all six paintings be displayed without their titles, so that the viewer is not instructed what to think about the images by what they are called. 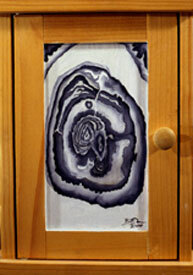 Number six is painted on a small box in which the titles of the paintings and a small mirror are mounted. This way the curious viewer has the opportunity to learn the titles, and see their own facial reactions as they do so. I hope you have enjoyed viewing this small portion of my work, and that you will take any opportunities to see future artwork that will be coming out soon. If you wish to contact me about possible display or purchase of these paintings or any of my other work, do not hesitate to contact me.